ferguson | "Name On The Trophy"
The recent 5-0 thrashing of Jose Mourinho’s Real Madrid by Pep Guardiola’s Barcelona team has seen the Nou Camp boss’s stock rise even higher by many in the media. Before ‘El Clasico’ many expected a tight, close match with both teams perhaps concentrating on nullifying the other’s attack rather than focusing on their own. Some pundits even expected Mourinho to outsmart Guardiola just as he had done in the Champion’s League several months earlier. Well how wrong some of them- and I say ‘them’ because I went for a Barca win, even if I did predict a 1-0- were as a Messi-inspired Barca simply ran riot over Real. It was dubbed as being a battle of the games two biggest stars in Messi and Ronaldo and that may have been true as the Argentinean dominated a game while his Portuguese counterparts most noticeable moment was a push on Guardiola which nearly sparked a mass player brawl. While most of the focus was on the two superstars of World football, many people, myself included were intrigued to see which coach would win the tactical battle. Mourinho’s had a fairly successful time so far since he arrived at the Bernabeu, prior to the defeat at the Nou Camp, his record in La Liga was played 12 won 10 drawn 2, while he’d coasted through his group in the Champion’s League. As usual for the self-titled ‘Special One’ he’d managed to grab a few headlines for more than just his results. His gamesmanship during the Champion’s League game against Ajax where he ordered Xabi Alonso and Sergio Ramos to get themselves sent off was arguably the most talked about football incident of the past few weeks. Mourinho’s antics didn’t go down too well with those lovely chaps at UEFA who hit him with an unsporting conduct charge and according to sources in the Spanish media, the Real board were equally unimpressed. Mourinho will have to learn that even success on the pitch is sometimes not enough at Real and members of their hierarchy expect the coach to behave in a certain way. When it comes to ‘behaving’ how the club would like Pep Guardiola could write several books on what’s expected of a Barcelona manager. The Barca boss hasn’t just delivered stunning success since he was elevated to first team coach, he’s also done it dressed like a catwalk model- male one obviously otherwise he’d look daft- and has been adept at keeping the fickle Barca money men and media happy. It’s been something of a dream tenure for Guardiola with the treble delivered in his first season and the La Liga retained last season. Of course there have been disappointments, such as the loss to Internazionale in last season’s Champion’s League and the relative failure of marquee signing Zlatan Ibrahimovic. Despite these setbacks Guardiola is still regarded as a star at the Nou Camp, after all his career as both player -where he won six La Liga titles and the Champion’s League- and manager has been a huge success. Knowing the club as he does though, Guardiola will be under no illusions about how long he expects to be in the job. The Barcelona job is not one you’d apply for if you were thinking about long-term security- only three managers have lasted five years. There’s been recent rumours that the best dressed coach in the history of world football could be heading to United one day as Fergie’s successor. There’s also been reports that the likes of Chelsea and Manchester City may have their wealthy eyes on him. Money isn’t a big part of Guardiola’s life though, in fact when he delivered the treble to Barcelona his wages were less then the majority of Premier League managers. While the oil-funded blue parts of Manchester and West London could offer him a lot more than he would get at Old Trafford, the chance of managing one of the other biggest clubs in the world may be too tempting to refuse. Let’s be honest when you leave Barcelona there’s no places you can go that are truly considered a step up but United is at the very least a step sideways. While I would welcome Guardiola at Old Trafford -especially if he could convince Messi to come with him- I think Mourinho would be a better choice. Unlike Guardiola, Mourinho has proven himself as a top manager at no less than three clubs in three different countries and could well do it with a fourth at Madrid. Many criticise his arrogance but I think it would actually serve him well at Old Trafford- after all almost everyone hates United anyway and do we really care? NO. The ‘us’ against the rest of the world mentality that Mourinho instills in his players would be perfect for United as we’ve never pretended to be popular with other clubs, fans or sections of the media. There’s also Mourinho’s knowledge of the English game, which proved particularly useful to him last season as he outwitted Chelsea. 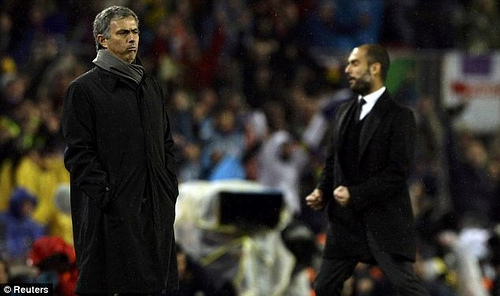 Like Guardiola, Mourinho would probably be courted by City, but would that represent the challenge he’s looking for? He’s already taken a club with money to the top of English football and it could be argued that by joining another ‘money-powered’ revolution he’d merely be going over old ground. The biggest challenge anyone could face is replacing Sir Alex Ferguson and that would make normal man baulk at the prospect of coming to Old Trafford. Mourinho isn’t normal though, he’s special. Guardiola’s work at Barcelona has been amazing but the Ibrahimovic signing may just have underlined why Mourinho is a little bit shrewder than his rival. Getting Samuel Eto’o and a pile of Euros for a player not nearly as good was the best bit of footballing business since Fergie rang Sgt Wilko. If United were to get either Mourinho or Guardiola it would be a massive coup and they’d arguably be the envy of most of Europe, as either coach is easily in the top three- no prizes for guessing who’d be the third. With Fergie showing no signs of retiring just yet, then there’s probably nothing to worry about for at least another season or two, but there’s always the question if Guardiola or Mourinho were to become available, would Fergie consider moving upstairs? I doubt it, very much and neither one is likely to be going anywhere very soon. However there’s no reason why Fergie wouldn’t speak to the circus that is the Manchester United board and point them in the direction of Spanish football”s most successful bosses, when he finally does hang up his hairdryer. Either one would be great but for me Mourinho would be perfect.